Well I just love this to pieces. I used to live in the coldest place on earth. O.k. well I’m clearly exaggerating. New Hampshire is cold but it’s no Alaska. Anyhow, I always remember the fall bringing in that fabulous crisp cool air. The smell of all things fall, bonfires and fireplaces, apple cider, apple pie, any kind of pie really (I LOVE pie), pumpkins, etc… Fall also meant bringing out the comfy sweaters, boots, and scarves; and then came the holidays. I didn’t stand a chance in hell not bringing out the larger pair of skinnies for the remainder of the winter. o.k. I won’t lie sometimes those got a little snug too. It was cold up there; I needed that extra bowl of lobster bisque what can I say! When I entered the month of panic. See we typically planned a yearly trip to Florida between February and March. I was clearly aware of this yearly trip throughout the fall and holidays but I still waited until that month or 2 weeks prior to our yearly trip to think about getting myself back in shape. Let’s just say I never felt comfortable in that bikini during our Florida trips. I felt self conscious and we were on vacation so trying to “eat” healthy or be conscious of working out was like torture during vacation. I say this and share this story for obvious reasons. If I would have indulged in moderation and continued a good workout routine I would never have had to ‘binge diet and exercise’ starting January 1. It’s not until I actually moved to Florida that I made my fitness and health a lifestyle not a ‘season’ during the year. It’s when I did this that my body transformed and I became a fit person year round. Granted I was very pregnant for 1/2 of last year; but I was able to bounce back by keeping that lifestyle throughout the pregnancy, fall, winter, etc… I’m not saying you can’t enjoy life, live, have a slice of pie for goodness sakes. Just be conscious of what you are consistently putting in your body and what you are consistently doing to get exercise in. 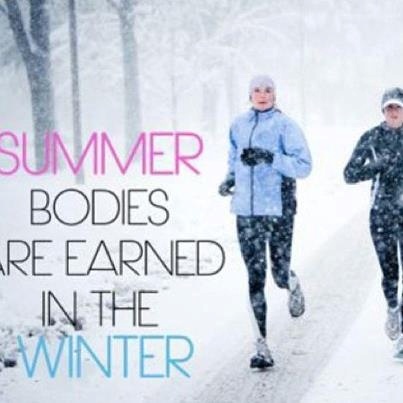 What are your go to fitness programs during the winter?